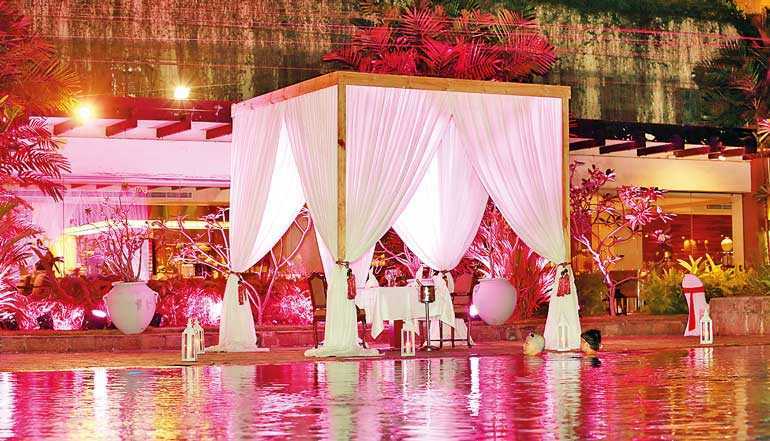 This February, Taj Samudra Colombo is geared to celebrate Valentine’s Day in all its grandeur, with a Valentine’s Dinner by the poolside in a private love hut or villa, exclusively for individual couples on the romantic night of 14 February from 7 p.m. to 1 a.m. It is that season of cupid’s arrow and many popular restaurants of the hotel will join in to celebrate the Valentine’s season in style from 11 February offering a range of goodies, availing couples with extensive food and beverages offers for lunch and dinner and many more menu options. All set to fall in love with the romantic atmosphere make a ‘love-go around’ to be indulged in February, only for the couples who go for a touch of luxury. Romance and elegance combined! An exquisite four-course dinner is on offer for couples on 14 February from 7 p.m. to 1 a.m. at the Taj Samudra poolside in a private love villa which is dimly lighted in pink which is Valentine themed in a silent and relaxed setting. This menu is complemented with caviar, lobster and Wagyu beef where the couples could customise the menu at their preference. A scrumptious dining experience to be curated by the culinary skills of Taj chefs and from the best ingredients sourced adhering to the standards of quality that it sustains. Unlimited flow of sparkling, wines and cocktails and Belgian handcrafted chocolates for each table at the hut resemble the luxury and creating the moments of life to be cherished forever. Interestingly, an igniting flambé dessert adds not only a strong flavor but a spark to this extraordinary romantic dining experience. Further reinforcing the hues of pink, roses will be for the lady and the nostalgia of the romantic momentum is not complete without a rose petal shower! Extravagance is at its epitome and entertainment is not an exception. Subtle and classy aspects will take care of your life’s magical moments exclusively for the loving couples. 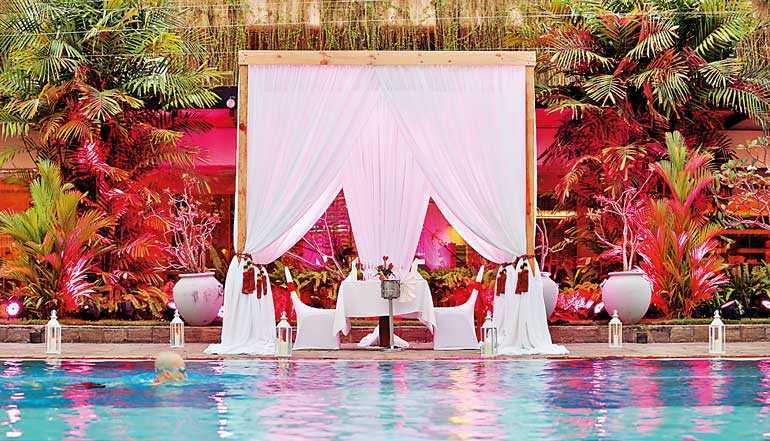 A violinist and saxophonist by the poolside set the tone with just the right romantic rhythm for that night to be a picture-perfect celebration at the perfect place in Colombo, at Rs. 30,000 nett per couple. Step in, relax and enjoy a fine dining experience as roses and pink have their say. Many restaurants of Taj are set to offer accompanying music and entertainment as is apt for Valentine celebrations, as musicians are a must and live music will fill the air at dinner. Authentic Indian delights by Indians chefs. At Navratna, lunch and dinner on an a la carte menu and couples who have a penchant to taste signature dishes in one setting can do so. The degustation menus at Rs. 7,000 for vegetarians and Rs. 9,000 for non-vegetarians for dinner per couple includes unlimited cocktails from the menu. At Ports of Call, a Valentine’s dinner buffet with action counters, grills and extravagant dessert selections is Rs. 3,500 nett per person, enthralled by Natalia the Ukrainian vocalist at dinner. From 7 February onwards, the sweet and savour delicacy outlet Pebbles will be on a romantic setting offering specialty cakes, cookies and boxes of chocolates and a two-piece band from 11 February onwards. In spacious restaurants, at the Yumi, the plush resto-bar for the best Japanese sushi menu in town, the set menu is at Rs. 12,000 nett per couple for dinner including unlimited sparkling wines or wine cocktails. A la carte options are available for lunch and dinner and a DJ will entertain guests at dinner; at the Golden Dragon, Szechuan cuisine by its Chinese chefs with ‘Private dining space,’ a 20% discount will be on offer on the a la carte menu for lunch and the set menu combined with unlimited wines is priced Rs. 12,000 nett per couple for dinner. Step into the Valentine’s Corner of Taj Samudra to have a look or perhaps to be hit by cupid’s arrow. For details contact the special event desk at the hotel lobby on 011-2446622.